After 12-24 hours, the surface retarder is washed away to reveal the aggregate in the concrete. Photo by: Photolango | Shutterstock.com. There are various methods of exposing the aggregate in concrete slabs and floors to create a decorative finish (see How to Expose Aggregate). However, the easiest and most reliable technique is to use a concrete surface retarder. Not only is this method safer and less labor-intensive than acid etching and abrasive blasting, it also achieves more uniform results, leaving the aggregate evenly exposed with no fracturing, dislodging, or color loss. What’s more, a surface retarder will give you greater control over the depth of exposure, allowing you to achieve the desired finish. If you’ve never used a surface retarder before, here are some basics to help get you started. What is concrete surface retarder? Surface retarders, also called surface “deactivators,” are applied to fresh concrete to chemically delay the set of the surface mortar. Unlike concrete set retarders, they allow the rest of the concrete to cure normally, without affecting the setting rate or strength gain. Because surface retarders work their magic by stopping the hydration process down to a controlled depth, the underlying concrete will harden properly while allowing easy removal of the surface paste later. When you are ready to expose the aggregate by hosing or high-pressure washing, the depth of aggregate reveal is more uniform with minimal pop-outs. When do you apply surface retarder? The best time to apply surface retarder is after you’ve completed all finishing operations and the bleedwater has dissipated. Don’t seal the concrete first or apply curing compounds, which could prevent the retarder from doing its job. Apply surface retarder evenly over the surface using a low-pressure sprayer or roller. Many surface retarders are designed to form a film over the surface that acts as temporary curing agent and protects the concrete from light rain and wind. However, if extreme wind or rain is expected, you should protect the surface with plastic sheeting. Tip: The most important issue when applying surface retarder is to ensure complete, even coverage. An easy way to visually monitor where you’ve sprayed is to use a pigmented surface retarder, which contains a tracer dye that allows you to see your progress. The dye will decompose in time after drying. How do you know when it’s time to wash off the surface? The time of surface retarder removal will vary with each job, depending on the concrete mix design and environmental conditions. Generally, the window is anywhere from 12 to 24 hours after application. Test a small area to determine if the depth of retarded mortar is at the desired level. If the depth is greater than desired or the aggregates begin to come loose, wait a bit longer before exposing the aggregate. Once the concrete is ready, remove the surface paste with a garden hose, a stiff broom, or a pressure washer. Tip: Before applying a surface retarder, be sure you will be able to remove it within 24 hours. If you allow the surface to harden longer, aggregate exposure will become difficult and may require sandblasting. What influences the depth of exposure? The depth of exposure will primarily depend on the surface porosity of the concrete when the retarder is applied, with deeper exposures produced on more open or porous concrete. The depth can also be affected by the length of time the retarder remains on the surface, concrete finishing methods, and the amount of water pressure and scrubbing action used during removal. Tip: Hard troweling of the concrete surface will reduce the effectiveness of most surface retarders. Using a wood float or broom finish will allow the retarder to penetrate more deeply and give you greater exposure. What precautions should you take when using surface retarder? Because surface retarders are water-based, they can be safely applied outdoors and in areas with low ventilation. Most products are biodegradable, environmentally safe, and low odor, with no VOCs. 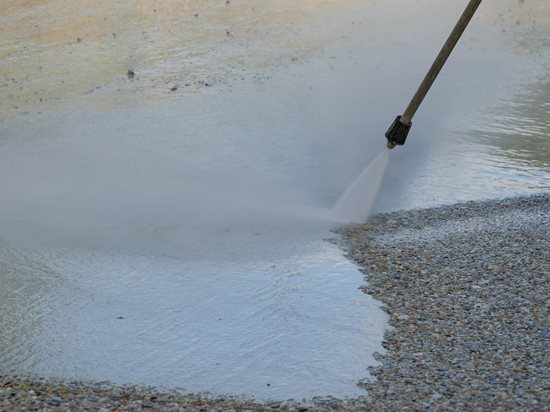 Any spilled product or overspray can be washed away with water or soaked up with absorbent material. Where can a surface retarder be used? You can use a surface retarder to expose the aggregate on any horizontal concrete including floor slabs, poured-in-place flatwork, and tilt-up and precast panels. In addition to exposing aggregate, surface retarders can also be used to create a roughened bonding surface for the application of concrete toppings. Another application is to facilitate the polishing of newly placed concrete. A surface retarder will soften the surface cement paste, reducing polishing time and the amount of heavy grinding needed. Do not use surface retarders on vertical concrete or on surfaces treated with shake-on color hardeners. The dense surfaces produced by color hardeners will inhibit retarder penetration. Tip: Surface retarders will only work on freshly placed concrete. However, you can still expose the aggregate on existing concrete by abrasive blasting. What different effects can you achieve? Some surface retarders are available in different grades to create predetermined exposure depths ranging from a light sandblast finish up to a 1 inch depth for large decorative stone exposure. You can also apply surface retarders to integrally colored concrete to achieve striking color contrast with the exposed aggregate. In addition to aggregate, surface retarders can also be used to expose other embedments, such as crushed shells or glass. Get other ideas for achieving special effects with exposed aggregate.